Des Moines, Iowa– While Ernesto Stone was working remotely he noticed a few unknown charges coming into his company’s Amex card. Puzzled, he logged into the corporate account and saw the chargers were occurring from his cell phone via iTunes iPay. Further perplexed, and suspecting someone had stolen his identity, Ernesto rushed to his iPhone. He would find it in the hands of his nephew playing Candy Crush Saga. Aghast, Ernesto snatched his phone from his nephew. Soon Ernesto found the in-app charges stopped. Relieved, he was left to be again perplexed on how the in-app purchases began. Ernesto was babysitting his sister’s kids while his sister would run some errands. He let his nieces and nephews play with his company iPhone. He allowed the shenanigans because he had age appropriate games from work installed. Ernesto told TheKohlrabi he didn’t worry that the children would be able to process in-app purchases without his knowledge. He knew the kids would need his password or thumbprint. 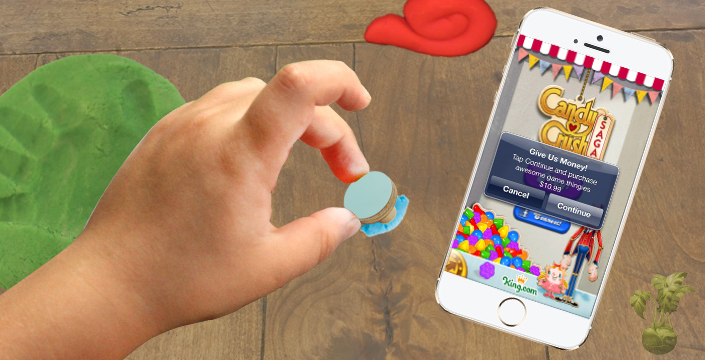 While Ernesto played with the children during Play-Doh time, the crafty children created a duplicate of his thumbprint to make in-app purchases. While Ernesto from King was tending to some business on his laptop, his nieces and nephews started playing the cultural phenomenon that is the candy crush game. This was done while using their uncle’s company iPhone. When the candy crush game asked for a password or identification, Sebastian, Ernesto’s nephew randomly grabbed a Play-Dough tool. This was the same tool which Ernesto had unknowingly imprinted his in-app enabled thumbprint. As far as Sebastian knew, every time the candy crushing game asked for more Play-Doh piece [the app purchase password] he was more than happy to obliged.